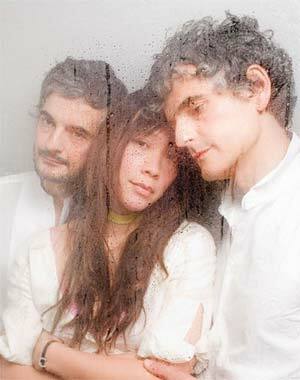 I ascended into the cavernous Metro on Saturday night and found myself quickly engulfed in the floating dream-like world that was Blonde Redhead. The fog and the darkly radiant purple curtains were no longer stage props, but musically conjured hallucinations, and the giant wooden pony - an invoked extension of Kazu Makino's ghostly, child-like vocals. An enthusiastic crowd spilled out of the main rooms' doorways to this sold out show. It would have been easy to guess they would open the show with "Dr. Strangleove", singing, "looking everywhere I see nothing but people." The enthusiastic and mesmerized crowd was attentive and even giddy, cheering just as fervently during the intros of songs as at their endings. Makino, wearing a long, silky gown-like outfit, was playfully mysterious and otherworldly, like something from the forest in a Tolkien novel. The Pace brothers( Amedeo and Simone) were equally captivating as Simone held together the group’s newfound haziness with his impeccable timekeeping and stunningly creative drum patterns. The band moved gracefully between tunes, playing mostly from their new album 23 ( a reference to the I Ching, an ancient Chinese text) which has, for better or worse, traveled into a more categorizing sound from their previously more eccentric recordings, but still retains many of the exotic melodies and clever rhythms that the trio are known for. The change has been more of a sonic one, using thicker, ambrosial textures, and dreamier riffs. The miserable butterfly has become more melancholy now due to its increase in altitude. The music was reminiscent of the angelic storm like sounds of Slowdive or Lush, yet it was still convincingly unique enough to feel as if I were seeing something for the first time. I stayed away from the bar but the show still left me intoxicated and subdued nonetheless. All opinions expressed by Spencer Kiss are solely his own and do not reflect the opinions of Stay Thirsty Media, Inc.